To meet the need for skilled workers original equipment manufacturers and parts manufacturers turn to universities, community colleges and technical schools to provide hands-on training. Here’s a look at some of the many significant programs. A shorter version of this story appears in the Spring 2019 print edition of Southern Automotive Alliance magazine. The state’s vast community college system works with state agencies to provide workforce training and works directly with employers to provide skills-specific education. For example, Mercedes-Benz U.S. International (MBUSI), the Mercedes-Benz automobile manufacturing plant near Vance, Ala., located about 36 miles southwest of Birmingham, is working with Lawson State Community College to train students. Upon completion, participating students will become full-time employees with Mercedes, according to Alabama Secretary of Labor Fitzgerald Washington. 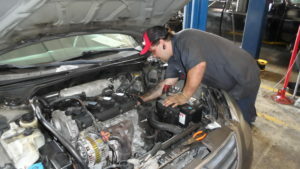 Participating students will earn a certificate in Automotive Technology. “This is a welcome partnership for Lawson State with Mercedes-Benz U.S. International and represents a significant bridge in educational resources and workforce development for our students,” says Dr. Perry W. Ward, President of Lawson State Community College. See story about Calhoun Community College elsewhere in this special section. Alabama Industrial Development Training (AIDT) is a workforce development agency under the supervision and oversight of the Alabama Secretary of Commerce. The program, which encourages economic development through job-specific training, often works with the Alabama Community College System to provide hands-on training. The Alabama Robotics Technology Park, in Tanner, Is a collaboration between the state of Alabama, AIDT, Calhoun Community College and robotics industry leaders across the nation. Alabama’s Ready to Work program, operated by the Alabama Community College System in cooperation with AIDT, provides a career pathway for individuals with limited education and employment experience. Ready to Work sites are selected on a priority basis according to economic need. As of March 2018, there were 75 sites offered through 22 institutions, including Bevill State, Calhoun State, Gadsden State, Reid State and Wallace State. Ready to Work’s workplace environment provides trainees the entry-level skills required for employment with most businesses and industries in Alabama. Training is provided at no cost to participants. 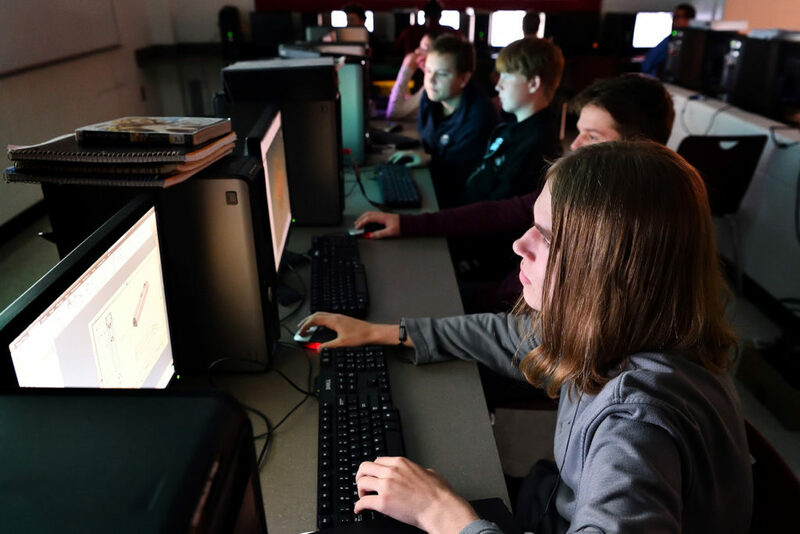 The curriculum is set to standards cited by business and industry employers throughout the state, and the skills cited in the U.S. Department of Labor’s Secretary’s Commission on Achieving Necessary Skills Reports. The curriculum is delivered through both online and classroom instruction. Upon successful completion of the program and earning 70 percent or higher on comprehensive assessments, graduates receive the Alabama Certified Worker Certificate, issued by AIDT and the National Career Readiness Certificate. Quick Start has numerous times been named the No. 1 workforce training program in the U.S., by Area Development magazine. The program is a division of the Technical College System of Georgia. It provides customized workforce training for companies creating jobs in Georgia. The program has almost 50 years of experience in automotive-related advanced manufacturing. Quick Start assesses workers, trains new employees and develops customized job-specific training using current techniques and media. Services are free to qualified companies, whether new to Georgia, expanding in the state, or adding new technology to stay competitive. During the past 10 years, Georgia has experienced a 78 percent increase in auto production, according to a Southern Company report. Quick Start often is on the front lines to train workers in areas that include metals, machining, welding plastics, composites and robotics. In 2006, Kia Motors Manufacturing Georgia (KMMG) moved to West Point, Georgia, which had lost its once-thriving textile industry to a move overseas. Kia invested more than $1 billion on its first North American assembly plant and hired 3,000 people. A small team of executives partnered with Quick Start from the outset, working initially in temporary offices provided by West Georgia Technical College to train workers. Today, Quick Start and Kia operate the Kia Georgia Training Center, a 70,000-square-foot training facility hailed by Kia’s leadership as “the new global benchmark” for advanced automotive training. Each year, the Tech-based Georgia Manufacturing Extension Partnership (GaMEP) works with more than 1,000 manufacturers, many of them in the auto industry, to implement on-site projects, conduct training, and connect manufacturers to Georgia Tech resources and its partners throughout the state. Tech’s Quality Core Tools for Automotive Manufacturing training helps operations reduce production defects, meet buyer demands, acquire new business and increase profit margin. HP Pelzer Automotive Systems, Inc. In October 2018, Dongwon Autopart Technology, a Hogansville, Georgia-based Korean maker of door frames, bumpers, and side impact beams and a supplier to Kia Motors’ plant in West Point, worked with Ga. Tech to reinforce the plant’s health and safety practices. The company wanted not only to be Occupational Safety and Health Administration (OSHA) compliant, but to enhance the company’s culture of safety, Larry Rogers, the plant’s safety and general affairs manager, told Tech. Working with Safety, Health, and Environmental Services (SHES), a program of Tech’s Enterprise Innovation Institute, Dongwon was granted Safety and Health Achievement Recognition Program (SHARP) status. The designation is awarded to companies with fewer than 250 employees, with injury and illness rates below industry average and that have an effective safety and health management system in place. Automotive investment in Kentucky continues to grow and providing highly skilled workers is essential for Kentucky’s economic growth, according to Derrick Ramsey, cabinet secretary, Kentucky Education and Workforce Development. The Kentucky Community and Technical College System (KCTCS) is the state’s primary provider of workforce education, delivering programs and services that address the needs of both businesses and workers. Kentucky’s statewide system of colleges provides customized training and support services for business and industry. The KCTCS-TRAINS grant provides employers with resources to offset the cost of training provided at KCTCS locations. Through partnerships with more than 180 manufacturing-related companies and Kentucky Community and Technical Colleges, KYFAME offers students an apprentice-style education-and-training program. Through KYFAME, students receive an associate degree in applied sciences, and, with the practical skills gained during their paid work experience, most begin full-time employment with the sponsor. Students can also continue toward an engineering degree. As of March 2019, there were 3,576 apprentices and 261 registered programs in Kentucky. In 2018, the Bluegrass State Skills Corporation and KCTCS-TRAIN initiatives provided more than $12 million in training resources to more than 5,700 companies and 120,000 Kentucky employees. Students learn technical skills in electricity, fluid power, motor controls, maintaining industrial equipment, programmable logic controllers, welding, machining, drawings, system troubleshooting and robotics; as well as manufacturing core exercises that include safety culture, workplace organization, lean manufacturing and machinery maintenance. In October 2018, Toyota Motor Manufacturing Kentucky, Inc. (TMMK), the Harrison County Schools district, area universities, Project Lead the Way, Kentucky FAME (Federation for Advanced Manufacturing Education) and The Manufacturing Institute announced a manufacturing-focused career pathway that extends from pre-kindergarten to master’s degree level; an achievement unparalleled, according to the National Career Pathways Network. While many school districts provide STEM education, the fact that the program begins in pre-K makes it unique, TMMK said in a prepared statement. Enroll in the Advanced Manufacturing Engineering program which would result in a bachelor’s degree. Students in the AMT program are sponsored by an area manufacturer where they work two days a week and attend classes three days. This allows students to graduate with little to no student debt. After earning their associate degree, students are often offered a job at a local manufacturer with a salary of up to $75,000. Almost 90 percent of FAME graduates have found jobs with the companies where they interned. Numerous training opportunities are available through the state’s division of Workforce Training and Economic Development and other programs. In addition, Mississippi’s 15 community colleges offer 26,403 training classes and serve more than 550 companies with customized training solutions. 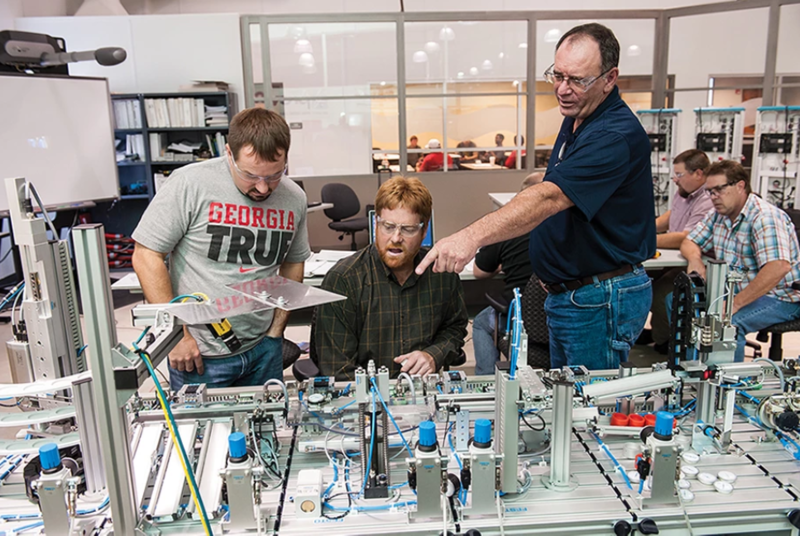 Northwest Mississippi Community College’s Advanced Manufacturing Partners program partners with industries across North Mississippi to provide highly skilled electronics engineering technicians. NMCC provides paid interns from their Industrial Electronics Engineering Technology program and currently partners with Toyoda Gosei, Schulz, FEUER, Parker Hannifin and numerous other companies. East Mississippi Community College offers the Center for Manufacturing Technology Excellence. The program provides training in skills needed by manufacturers, including measuring instruments, problem-solving, applied math, critical thinking and more. The Center for Manufacturing Technology Excellence at East Mississippi Community College is an advanced technology training center utilized by business and industry to conduct worker training. The program offers manufacturing skills certification classes, M3 Production-level certificates, M3 Advanced Production Skills classes and specialized training for companies. Mississippi’s four major public research universities play a vital role in Mississippi’s economic and workforce development. They are: University of Mississippi in Oxford, Mississippi State University in Starkville, University of Southern Mississippi in Hattiesburg, and Jackson State University in Jackson. The Center for Advanced Vehicular Systems (CAVS) at Mississippi State University helps businesses improve engineering, manufacturing and design technologies. CAVS has a facility in Starkville and an extension center in Canton, which is across the interstate from the Nissan plant. The CAVS locations provide both research and development capabilities, as well as continued education and training for new and current industry employees. 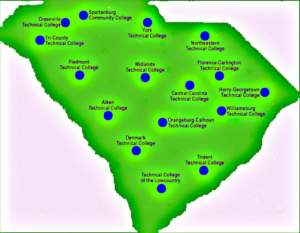 The South Carolina Technical College System is comprised of 16 community-based technical colleges throughout the state. Home to the readySC™ program, the SC Technical College System serves more than 249,000 students and excels at creating programs that meet the needs of area businesses and industries. Cooper Standard, a leading supplier of systems and components for the automotive industry. The company planned to fill 180-plus positions in Spartanburg. Mercedes-Benz Vans, which opened its South Carolina facility in September 2018. The facility will provide up to 1,300 jobs by the end of the decade and is expected to create at least 600 additional jobs in the region through its suppliers. For 50 years the South Carolina Technical College System has powered readySC. The program recruits, screens and trains employees; and creates a curriculum to fit a company’s specific needs. The program served 88 companies and trained 5,070 people in fiscal 2017-2018, the last period for which numbers were available. Jobs projected must be permanent. Pay represents a competitive wage for the area. Benefit package must include health insurance. Number of jobs created must be enough to allow readySC™ to provide training in a cost-effective manner. With 900 auto suppliers and 135,000 people employed in the automotive industry, there is a big demand for skilled workers. Many of the state’s training programs involve partnerships with educational institutions. In 2017, Nissan partnered with the Tennessee College of Applied Technology (TCAT) in Murfreesboro to open a training center in Smyrna for careers in advanced manufacturing. The programs are part of Tennessee’s strategy to create a pipeline of high-skilled workers in the state. Tennessee College of Applied Technology at Murfreesboro works with Nissan. Bridgestone partnered with Motlow State Community College to develop a mechatronics program based on the Siemens Mechatronics Systems approach to advanced manufacturing. Electrolux and the Workforce Investment Network (WIN) partnered to provide training through WIN’s Industrial Readiness Training program. Classes are based on Electrolux’s specifications and training requirements and are offered at the Southwest Tennessee Community College in Memphis. Drive to 55. The program aims to bring the percentage of Tennesseans with college degrees or certifications to 55 percent by the year 2025. Tennessee Promise. The programs aims to provide two years of tuition-free community or technical college to graduating high school seniors. More than 33,000 students have enrolled in the program. Approximately 40,000 people fill vehicle or parts manufacturing jobs in Texas, and the industry is expected to grow. The Texas Workforce Commission has dedicated $1 million to address skills gaps and ensure a talent pipeline is available to address regional industry needs. Private employers or corporate foundations can collaborate with the state’s Workforce Solutions program to apply for funding for Workforce Innovation and Opportunity Act (WIOA) activities that support workforce development for six designated industry clusters. The clusters include advanced technologies and manufacturing. Training in high-demand skills often is provided through state partnerships with community and technical colleges.